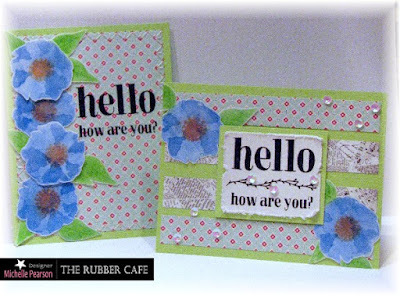 The Rubber Cafe Design Team Blog: More Chalk Pop! I have a few more happy cards for you today using The Rubber Cafe's April Creative Cafe' Kit - Petticoat Fashion and the Chalk Pop Technique! 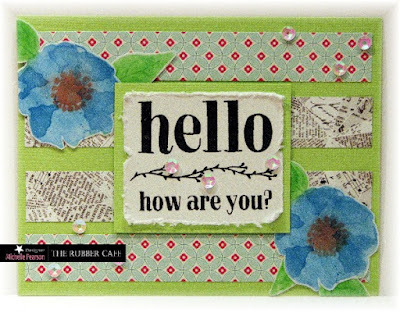 I used the flowers from the Hello, World stamp set. They look sort of like Morning Glories to me...and I have fond memories of them winding their way up the iron railings as I headed of to school spring mornings as a child. I chose chalks in the blue tones for these flowers. I inked the solid image with Versamark ink and then patted the light blue chalk onto the image. Next, I stamped the more detailed stamp with Versamark over the chalked image and patted the darker blue chalk on top. As a final step I inked the flower center with Versamark and then add the orange chalk. The leaves were done in a similar way with light and dark green chalks. Once the images were colored, I fussy cut them. I used some of the patterned paper from the included paper pack and did a fun paper embroidery edge around it. HINT: Use the pattern of the paper to pierce your embroidery holes. I love the symmetrical look you get! I used 2 strands of white embroidery floss. 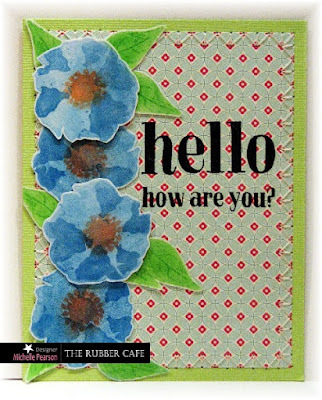 Flowers are then popped onto the card, some flat and others on foam tape as desired. I stamped the sentiment with Versafine Black ink. This card was done in a similar fashion using scraps of the paper from the kit.